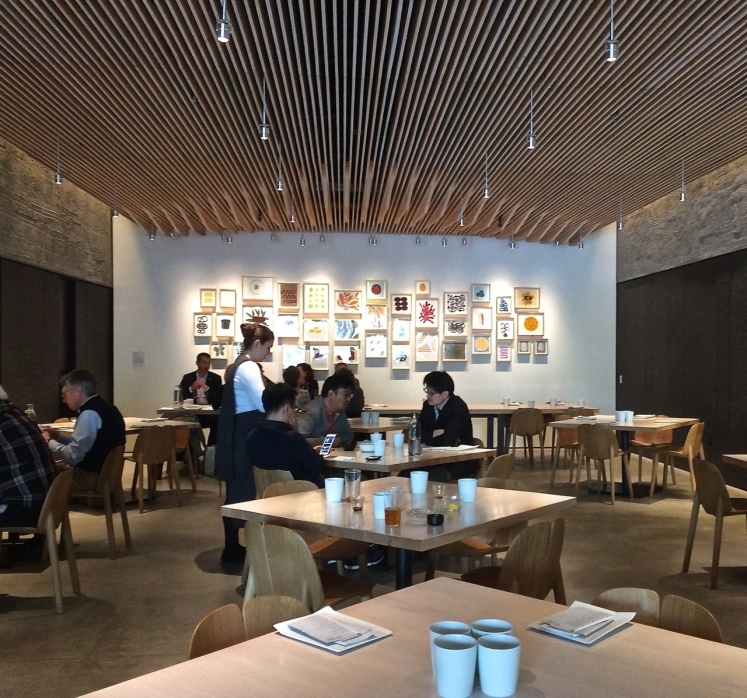 The concept behind SFMOMA’s new restaurant, in situ, is to work “directly with chefs and restaurants around the world to faithfully execute their recipes.” What this means is that the menu consists of dishes from leading restaurants from countries around the world including Canada, Germany, Japan, Turkey, Spain and the USA. It’s not unusual to respond to a piece of modern art with the question, “What is that?” It is unusual to respond to the dishes on a menu with the same question. For example, while The Forest from France ($28) does, indeed, look like a forest floor and not something one usually eats, it consists of quinoa risotto, mushrooms, and clusters of noofa-looking, edible but tasteless “parsley moss.” The Lamb Shank Manti (Turkey, $22) includes tomato, smoked yogurt, and sumac and bears no visual relation to a lamb shank. The Jasper Hill Farm “Cheesecake” from Spain is a replica of a tiny round of cheese with a tan skin. It tastes pretty much like a super-soft, mild brie. And it costs $22. Each dish is designated with a symbol indicating portion size: small, medium, or large. The large symbol could be eliminated as all the dishes are small or, at best, medium. The prices, on the other hand, could be designated large. A tiny portion of marinated salmon will set you back $28. SFMOMA is the home of cutting-edge art, where stretching creativity and imagination are nurtured. In creating in situ, the museum continues its mission of innovation and vision, this time in the kitchen. And that would be fine, but for two things: Price. And portion. Their inverse relationship dulls that cutting edge.